Tilikum, the famous killer whale sadly best known for being involved in the deaths of three individuals, has died at SeaWorld’s Orlando facility, the company said Friday. He was approximately 36 years old. The Associated Press reports that SeaWorld has not given a cause of death, though earlier this year they said Tilikum had a chronic bacterial infection in his lungs and did not seem to be entirely optimistic about its treatment. (In a statement, SeaWorld wrote, “The suspected bacteria is part of a group of bacteria that is found in water and soil both in wild habitats and zoological settings.”) Shortly after, the company said they would no longer be breeding killer whales in captivity. Known for his large size, Tilikum was captured off the coast of Iceland in 1983 and taken to a park in Canada before being sold to SeaWorld and moved to its Orlando location. In the early days, he was treated as a highly valuable commodity, specifically for his sperm; in a lengthy 2010 article, Outside magazine noted that “Media reports at the time [of his transfer] pegged Tilikum’s price at $1 million.” He would go on to sire 14 other whales. Following the release of the documentary Blackfish, which focused on Tilikum and the low quality of life experienced by whales in captivity (specifically at SeaWorld and similar parks) and how that can result in violent behavior, the company received increased pressure from government agencies and the public to stop treating massive mammals like poorly-cared for domesticated pets. The statement on Tilikum’s death contains more of the same; a clear acknowledgment of the loss of trainer Dawn Brancheau, who drowned after she was pulled under the water by Tilikum during a performance; the suggestion that Tilikum did not die young, as it has been posited many killer whales who live in captivity do; and a reminder that technically, SeaWorld did not “collect” Tilikum in the wild, that they no longer do that, and that they are no longer breeding killer whales in captivity (which is now illegal in California, where they have a San Diego park, anyway). 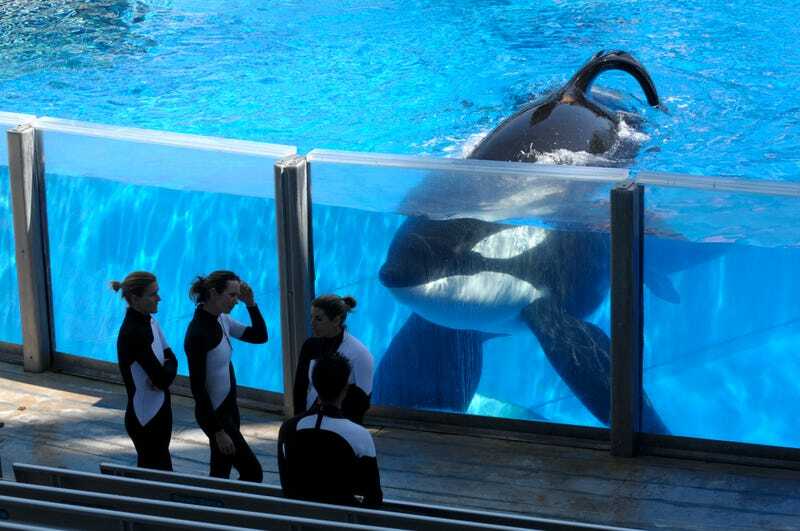 According to SeaWorld, 22 killer whales remain in their parks in Orlando, San Antonio and San Diego.